Caption slip reads: "Photographer: Richardson. Date: 1951-10-18. Reporter: Swaim. Assignment: Cinderella, Pasadena. K5, 6: 'Who, Me?' 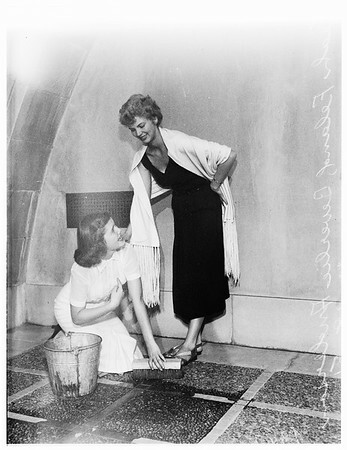 says 16-year-old Leah Feland, Muir College freshman, as 'Fairy Godmother' (1949 Rose Princess) Beverlie (cq) Anderson tells her she was chosen 'Cinderella' from 150 contestants, to reign at charity ball Oct. 27. K21: Leah Feland, 16, 'Cinderella'. K13, 14: L. to R." 1949 Rose Princess Beverlie Anderson, Le Ann Short, 15 (PCC), Judy Lynn roberts, 16, (PCC)m 'Cinderella' Leah Feland, 16 (Muir), Sandra Gilman, 16, (Muir), Carol Neeley, 16, (PCC) and 1951 Rose Princess Norma Drageset. (Short, Roberts, Gilman and Neeley are 'Ladies in Waiting to Cinderella Feland)". Note: K21, 13 & 14 are missing.